The Lord Gives Information about His Millennium Reign! The Lord said, “My people don’t know the questions they should be asking!” We here at Take His Heart were certainly no exception. We didn’t know we needed to ask about the Spots on the Body of Christ, so the Lord brought them up to us. He did the same with the understanding of what it takes to be married to Him. The Lord brought forth the information concerning how to let Him reign and rule His church in Golden Meetings. We certainly didn’t know we needed to ask the Lord questions pertaining to any of these subjects as well as many others. Why is the Lord bringing forth this information about the Millennium now? It’s because we are living in the Last Days when the Lord is making up His Jewels, His Spotless Bride, for His purposes. His marriage was preordained in the beginning, as well as the Millennium. Mankind cannot stop it. So I hope by now you can understand the surprise we had for the Lord to reveal that we had the Man-Child of Rev. 12:5-6 here. There it was before us and the thought of asking the Lord anything about the Man-Child had never crossed our minds. That information is on this site, as well as all the other subjects I have mentioned. This brings us to the Millennial, 1000-year reign of Jesus Christ on the earth. Could anyone of us have known any correct important question to ask the Lord about the Millennium? Something we needed to know about it now? We certainly did not. The Lord’s Millennial reign was of no concern to us - out of sight, out of mind! I suppose it was because we knew it was just out there in mankind’s future somewhere and had little, if any, understanding of it. Here we are again surprised at what the Lord has brought up at this particular time, the Millennium! Here are some of the events the Lord used to reveal something He wanted us to learn about His rule and reign in the Millennium. We can gain insight into events taking place before its manifestation. Both scenes depict hideous torture of Christians to death, in a compound. Both scenes reveal God’s protection for some Christians. I suggest you read the 2006 article for the understanding it gives. In other scenes, some recorded on the site, the Lord has used a Jeep as a “go anywhere, do anything you want to do” symbol. The color and type of Jeep the Lord has used before was depicted as a Jeep a person should not want to be in, symbolizing they were just going through life doing whatever they wanted to do when the Lord had shown them otherwise. I’m thinking of two people the Lord had shown me in the past who were driving these wrong kind of Jeeps. Both are with the Lord now, but it was the enemy of mankind who took their lives. So we see some of the importance of understanding symbolism. A good way to think about Christians who are shown to be wearing tan clothing is that they are earthly and do not have the right acts in their lives. It’s easy to see in the scene that they had no protection. We should understand why in the scene I just shut the Jeep off. The scene was meant for me to see what was going on in the compound and then to see the banner at the end. In this same movie there is a scene where I was shown we can have the same kind of protection Jesus had when He walked through the people who wanted to kill HIm. I experienced this same thing in the scene with people who wanted to kill me, so I know this protection is possible. I was told what it takes to have this kind of protection. I have shared this here because it is this type of protection that will glorify God when this great gathering of Christians for their demise takes place in the future as the scene reveals. So we see the importance of coming into covenant with the Lord and gaining His protections. I had to look up to see the people I saw before the MILLENNIUM banner emerged. Is there a message in that? Could be! It is plain that the Lord has revealed a great persecution of Christians will take place before the MILLENNIUM. No doubt this will be world wide, not just in certain countries as it is now. But what did the Lord reveal about His MILLENNIUM reign that is important to us now? To continue this report, on August 25, 2012, the Lord showed me that He wanted three large pictures (or murals) to come together to make one big mural for everyone to see. I have depicted a semblance of what I saw. 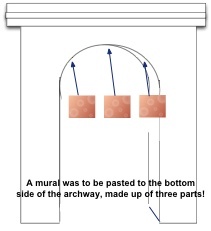 The murals were to be placed permanently, covering the whole bottom of the arch. The arch being concave represents covenant. I knew He was bringing something important together and it was to be in a public place. But people will have to look up to see the mural, just like I had to look up to see the banner. On August 26, 2012, the Lord revealed there was something having to do with Golden light in the earth that needed to be expanded. I was shown that I had a 200-foot tape and could measure how much it needed to be expanded. I didn’t know how much. The scene changed and I was measuring something in that Golden Light. When I awoke from the scene I remembered that years ago the Lord showed me I had a measuring stick and could measure anything. I always thought this had to do with keeping a corporate flow chart. I meditated on the latest things the Lord had brought forth and realized the Lord was encouraging me to ask a question that had emerged in my mind from knowing: 1) The understanding that has developed from having so many Golden Meetings and Judgement Meetings. 2) The scene of the Lord wanting to bring some pictures together. 3) The Man-Child information. 4) The fact that the Lord had brought up His Millennial reign to me for the first time. I realized a question answered could be the measuring of something unknown, certainly something I didn’t know. Remember the Man-Child rules over nations with a rod of Iron! "And she brought forth a 'MAN-CHILD,' who was to rule all nations with a 'ROD OF IRON': and her child was caught up unto God, and to His Throne." LORD, is the Man-Child information (not sure of the right word) “The means” whereby HE will rule & reign in the Millennium? The Lord’s answer was affirmative and when it was revealed in our after meeting, it was one of those breath taking moments. Here are a couple of things that were revealed by the Lord in answer to the question. The question in the envelope was seen going to God’s Throne, represented by a voice (like it was) coming out of a megaphone. The words reached the Throne and they were sounded to the Lord and He manifested them back to us. The Lord taught us years ago that dust represents “soulish,” meaning there was a mixture of soul in whatever it was that was coming forth or being done. The reason the Lord said “dust proof” in His answer is because He wanted to emphasize what He has taught us. He wants it established that having Golden Meetings and Judgement Meetings correctly keeps the soul of man out of communication, enabling the possibility of being able to produce the Man-Child with the Lord. We practiced Judgement Meetings for a long time before the Lord started telling us we were getting pure judgements from Him. I hope you can see the importance of coming into covenant with the Lord and learning how to let Him reign. He is going to reign in the Millennium and the Man-Child is the means, as He has revealed. I’m sure there is more to come. 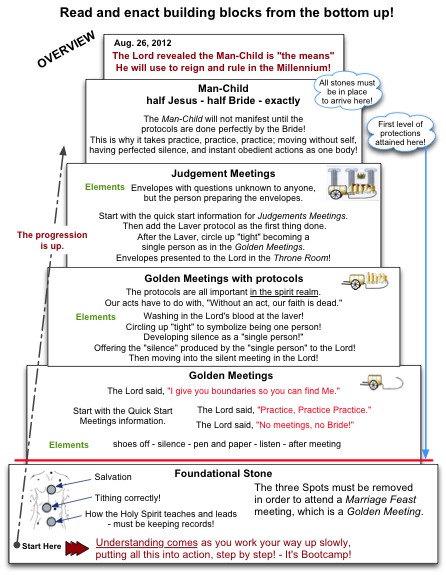 PDF of Overview with Temple progression information added.